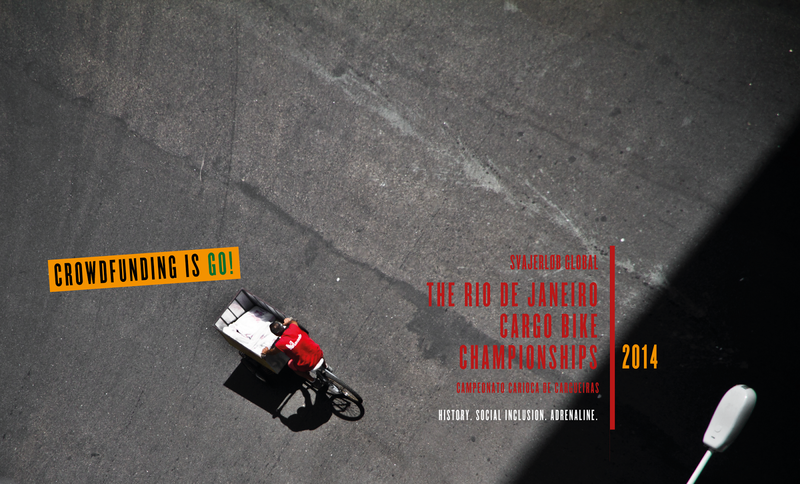 As you will have seen by now, here at Copenhagenize Design Co. we are currently in the midst of a crowdfunding campaign, raising money to organise a cargo-bike race in Rio de Janeiro, in order to raise the profile of the under-privileged cargo-bike riders of the city. But why do we want to raise their profile? And why do they need their profile raised? As you may remember, a couple of years ago our partners in Rio de Janeiro, the NGO Transporte Altivo did an extensive cargo bike count of the city. 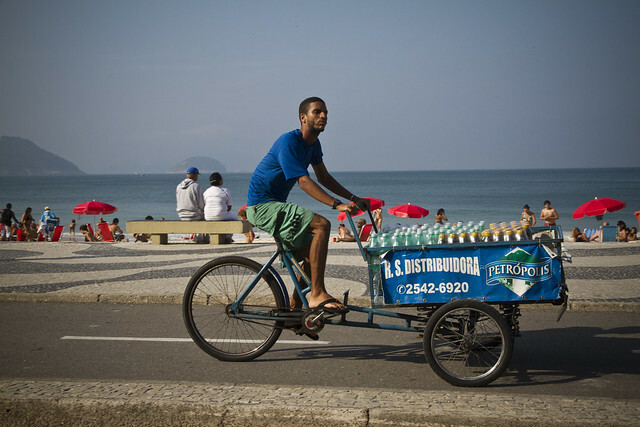 This showed that each and every day in Rio, there are over 11,000 cargo bike deliveries. It also showed how hard they work: loads in excess of 200kg are not uncommon. Why is this important? Well, Brazil’s economy is growing at breakneck speed, and by 2016 it is set to be the world’s 5th largest economy. Cargo bikes are vital to the cities that power this growth, connecting the country's otherwise car-clogged urban environments and ensuring Brazil’s powerhouse economy keeps ticking over. This economic growth has led the middle class population to increase by over 40% but not everyone has been swept along in this great new wave of Brazilian prosperity. Although Brazil has changed drastically, and overall inequality has slightly decreased over the last ten years, there are still large pockets of poverty and deprivation, and Rio is one of the most unequal cities in the world. As the opportunities offered by the city grow, so too does its allure, and so too does rural to urban migration. Rio now has a population of over 11 million but simply can’t keep pace with the level of growth and new arrivals to the city often end up in favelas on the hillsides of the cities, in ‘temporary’ housing that soon becomes their permanent home. It is here where the vast majority of cargo-bike riders come from. Whilst conditions in many favelas have improved a little in the last few years, they are still extremely poor neighbourhoods, where the average monthly income is $180 a month, barely half the official minimum wage. The prizes for our cargo-bike races, which will be funded by our crowdfunding campaign, will amount to two months’ wages for the victors and in conjunction with local businesses, we will also include household items such as fridges or mattresses as prizes: vital products that with rising prices in Brazil are becoming increasingly unaffordable for the poorer population. But of course, it’s not specifically about the winners. Though making a difference to their lives will be fantastic, we’re not doing this to just benefit a small handful of the thousands of cargo bike riders. Merely by drawing attention to the impact of these seemingly modest, but nevertheless significant prizes, helps to illustrate the difference in economic reality between the rich and the poor in Brazil. But it of course goes beyond prizes. Firstly the poorer residents will, both metaphorically and literally, no longer be hidden away in the narrow winding streets of the favelas, out of sight and out of mind. It is a lot harder to ignore society’s inequalities when they are right in front of you. As the widespread riots in Brazil last year showed, not everyone has been included in Brazil’s progress, and discontent is rife. 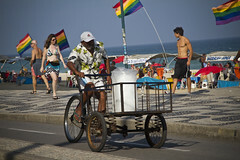 Enabling society to see their poorest members in a different light will be a positive step towards increased equality, and towards the inclusion of the cargo bike rider’s neighbourhoods in the plans, hopes and dreams of the new Brazil that any journey round Rio de Janeiro reveals is being constructed at immense speed. Secondly, the importance of the cargo bike will also be brought out into the open. The cargo bike will no longer be associated with some unseen and faceless ‘underclass’. It will be associated with real people, whose endeavour is admirable and vital. Their cargo-bikes will be recognised as the vital tools for the city that they are. The future of transport, and as a consequence, of the city, will eventually be more about the bicycle than the car. It simply has to be. Rio can barely cope with the present number of cars, let alone any further growth. The cargo bike riders are doing it right. But as well as lacking basic opportunities in their neighbourhoods, they are also lacking even the most basic cycle infrastructure and this is no way to encourage more people to bike. In our CycleLogistics work we have seen that 51% of all motorised deliveries in Europe could be made by Cargo-bike. 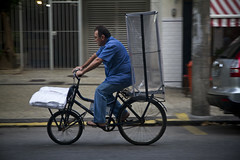 Rio has such a high number of cargo-bike journeys that it could be seen as one of the cargo bike capital of the world. But it risks going backwards if it follows the mistakes made by European cities in the past: of a growing middle class leading to growing car ownership, leading to clogged roads, and cities that are not life-sized but instead car-centric, un-liveable and un-loveable. The roads are so congested that a 10km bus ride in the suburbs of the city takes 90 minutes. The widespread protests that took place across Brazil last year were set off by a 20¢ increase in bus fares, showing firstly the precariousness of everyday life in Brazil, but also the massive importance of good transport infrastructure. Cycling is the best way to get from A to B in any urban environment and anything that helps to increase this needs wholehearted support. Creating a cycling culture in a city does not happen overnight. Car ownership in Brazil is still growing, but reappraising the role of the bicycle in its society can only lead to vast improvements. 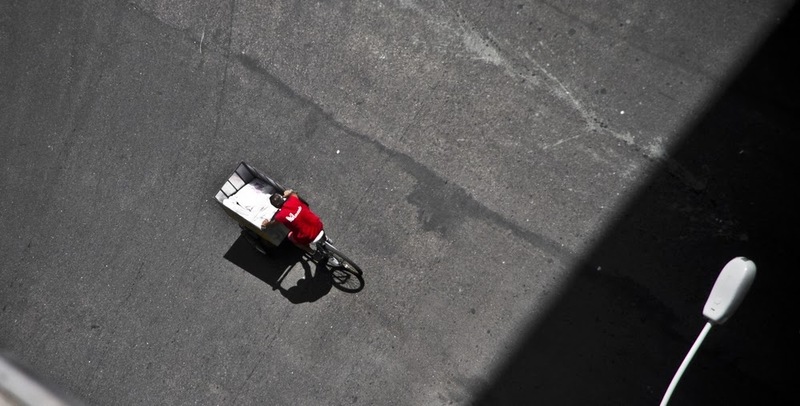 Cargo-bike riders hold the key to a better Rio de Janeiro, for everyone. Our race will be held at the Copacabana, one of the most famous locations in Rio de Janeiro. Situating our race here will show the whole city that the cargo bike riders and their neighbourhoods should not be forgotten, and neither should the most useful tool available for creating liveable cities: the humble bicycle.